I've got a serious case of the holiday holy cow it's going to be here in twelve days! 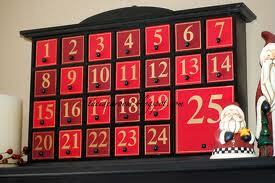 Thanks are owed to the advent calendar for reminding me this morning we are day 12!!! Thanks are also due to Child #1 who did the math and said "Halfway there!!!" There's glee in her exclamation points. Mine contain something else. I won't go into details, but I can assure you it's not glee. Still, since we're halfway there and all, I thought you might like a little taste of what Child #1 and #2 have been singing as they deck the halls and do their whirling dervish dance through the Chrismakkah month. It's an ode to our hamster, Ninjy, set to the tune of the timeless holiday classic, "You're a Mean One, Mr. Grinch". And although it's silly, I admit this song just might be my favorite thing about Chrismakkah 2012. Enjoy! You squeal like a rat. You dig them up all day. And you're terrified of the cat. You're a Fat One, Ninjy-boo. And make Fiesta Max demands. (Given a choice between the two, I pick climbing on your cage). You're a Brown One, Ninjy-boo. You camouflage nicely with the mud. We keep you in the cage. But we like to take you out. You're our favorite hamster spud. We tried to feed you Rodent Block. You hid it in your shavings. We learned that carrots stop you in your tracks. Labels: Chrismakkah. Hamsters. Mr. Grinch. It's a game of one of these things is not like the other. Christmas. 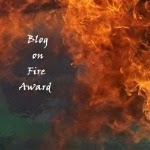 Fiction. Writing. I have to admit, that is pretty clever. 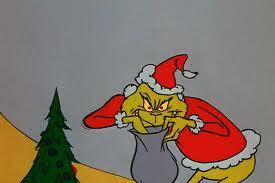 I heard the Mr. Grinch song just this morning. Now I can't wait to hear it again! 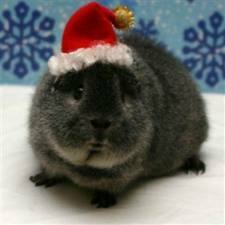 I'm not a fan of Guinea pigs, but that one in the Santa hat is adorable. I actually laughed out loud as I was singing that...how weird am I!!! Your kiddos are pretty clever. I about lost it at hamster spud. Best song ever! I feel the love of fat Ningy.